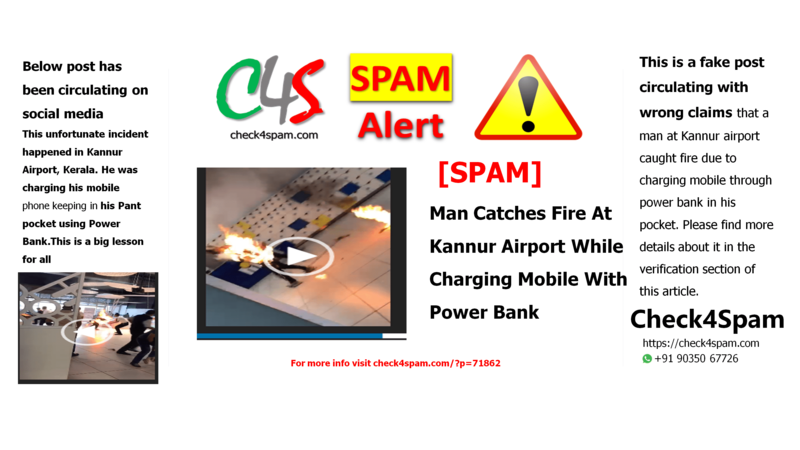 This video is circulating on social media with wrong claims that a man at Kannur airport caught fire due to charging mobile through power bank in his pocket. Please find more details in this article. This unfortunate incident happened in Kannur-Airport,Kerala. He was charging his mobile phone keeping in his Pant pocket using Power Bank. In fact the incident happened at Marjane Shoppers in Agadir on 3rd June 2018. A 30-year-old man set himself on fire at the main entrance of the supermarket Marjane, on June 3. After local authorities arrived, the man was transported to Hassan II Hospital in Agadir with second- and third-degree burns,. Someone played a game of sharing chunk of this original video. 20 sec video is being shared on different medias with wrong claim of a man catching fire due to charging his mobile through power bank. This is how some mischievous people spread the fake news and it keeps rolling through various social platforms fooling others. This is to get maximum number of followers and views. Please find out facts at fact checking sites like ours or any other site to be aware of truth.